Powers/Abilities: Magneto was a mutant with the power to manipulate magnetic fields, giving him power over most metal, but he needed an amplifier to use his abilities over a great distance. 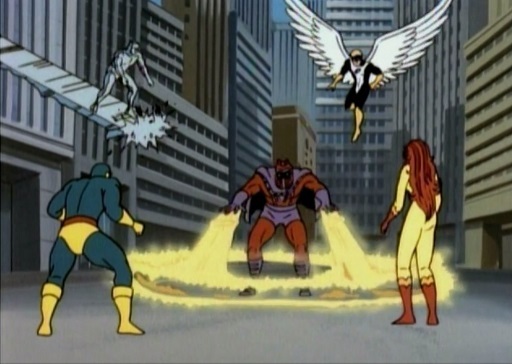 History: (Spider-Man & His Amazing Friends cartoon episode - "A Fire-Star is Born" (fb)) - At some point, Magneto battled the X-Men and used his powers to escape the team. (Spider-Man & His Amazing Friends cartoon episode - "The Prison Plot" (fb)) - At another point, Magneto fought Spider-Man in a cave and tried to detain him with handcuffs he magnetically controlled. 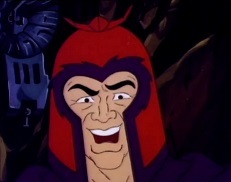 (Spider-Man cartoon episode - "When Magneto Speaks...People Listen") - During the night, Magneto attacked the New York Power Plant, disabling the planet's transformers and plunging Manhattan and the rest of the East Coast into darkness. While the city was panicking, Magneto plucked several communication satellites out of the sky. The next day, power was restored but the broadcasts of all networks were interrupted by a shadowy figure calling himself "Mister M" (actually Magneto, keeping himself hidden). His demands were one hundred million in gold if the world wanted its satellites returned. He then gave the world three days to decide. When Spider-Man yanked the wall down, Magneto tried to attack with a magnetic beam but Spider-Man jumped out of the way and webbed the mutant up. Calling upon his power, Magneto easily snapped the webbing and seemingly buried Spider-Man under a pile of metal equipment before turning his attention back to the launch. 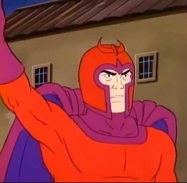 Later, Magneto was watching the launch of a new satellite from his headquarters on the base and was so focused on the launch he failed to notice Spider-Man taking pictures or webbing the outside wall. Using his powers, he drew his magnetic magnifier to him and boasted of its ability to increase his powers. He was surprised when Spider-Man turned up, having escaped the rubble shortly after being buried. They engaged in a tug of war with the magnifier and Spider-Man eventually let it go, sending the machine crashing into Magneto, seemingly knocking Magneto out. Magneto was simply pretending, however, and when Spider-Man turned his attention to his camera to check it was ok, Magneto bound the hero with a metal wire. When the rocket housing the satellite launched, Magneto (with his power amplified by apparently another magnifier), held the rocket in place. Unseen by Magneto, Spider-Man snagged two of the magnifier's wires with his webbing and pulled, shutting the machine off and freeing the rocket. Enraged, Magneto lifted Spider-Man up via the wire and deposited him onto the rocket's nose cone as it achieved orbit. He watched the satellite's chaotic path with glee. A short time later, Magneto watched as the world leaders asked for more time from his underground Easter Island lair. Angered, Magneto used his magnifier again. He targeted a nearby Army base and stole all the weapons, trucks and tanks before dumping them atop the Central Park Zoo, causing mass chaos. Seeing Spider-Man riding the satellite down towards Easter Island, Magneto went back to the magnifier. With his powers, he tried to crush Spider-Man with the Island's statues. When Spider-Man webbed the statues together, he used another statue to try and blast Spider-Man with lasers, but Spider-Man directed the deadly beams thanks to a nearby satellite dish, destroying the statue and exposing Magneto's base. Magneto was quickly trapped with his own powers when they were reversed, uncontrollably attracting surrounding metal onto Magneto as Spider-Man used a modified microwave relay in an attempt to put everything back to normal. From there, Magneto's powers were drained by the relay and used to restore the satellite's proper place. With Spider-Man distracted putting everything back to normal, Magneto slipped free and escaped via a hidden door, swearing revenge. 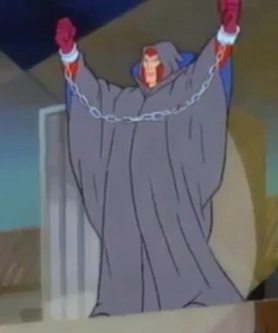 (Spider-Man & His Amazing Friends cartoon episode - "The Prison Plot") - Magneto, calling himself Proton the Great, convinced the organizers of the National Warden and Police Chief Convention via unrevealed means to perform at the site of their latest gathering with the promise that he could escape from anything. He arrived in an armored truck and exited the truck thanks to his powers. He then wooed the crowd by making his shackles fly off and over the prison walls, a trick that reminded Spider-Man of the last time he fought Magneto. Proton the Great then demonstrated his next trick, the Sands of Time, a massive hourglass. He promised the crowd that he would be sealed inside the shatterproof glass, which would then be turned upside down, burying him in sand and rock. When he asked for a volunteer and Spider-Man appeared, Magneto doffed his disguise and dragged Spider-Man into the hourglass via the iron in his blood. From there, Magneto contained the island prison in a forcefield and stripped the police officers of their weapons and metal fixings. He issued his demands, namely the release of his Brotherhood of Evil Mutants from their various prisons. When his demands were refused, he flew to a nearby train yard and destroyed the trains, boasting that he would starve entire cities unless his fellows weren't released. When the Spider-Friends attacked, Magneto fought back. Iceman covered him in ice but Magneto blasted it away with a magnetic forcefield. Spider-Man's webs were also equally ineffective. When the team left to regroup, Magneto shut down the power to the entire northeast, plunging the whole section of the country into darkness. He announced on his microphone his intentions until Firestar flooded the room with steam. He countered with more magnetic forcefields, neutralizing her powers and trapping her in a freezer. Seeing Iceman and Spider-Man trying to sabotage the prison's generator, which was fueling Magneto's extra power, Magneto turned his focus to them, sealing Spider-Man inside a giant water tower before levitating the tower towards Niagara Falls. He then seeded the falls with iron filings from a nearby iron works and magnetically directed the flow of the water upwards into the sky, dragging the water tower with it. Magneto threatened to drop everything, including Spider-Man onto the rocks below. Flying back to the prison, and unaware that Spider-Man was saved by Iceman, Magneto threatened to detonate America's nuclear missiles unless the Brotherhood was freed. When an escaped Firestar attacked, Magneto wrapped her in barbed wire, but her remarks about the other Spider-Friends shutting down the nearby power plant made him leave. Upon arrival at the power planet, Magneto sent the power plant's loose metal flying wildly around, striking Spider-Man and Iceman, unaware that he was being lured between two massive dynamos. Once he was in place, the dynamos were activated but they ultimately served only to increase his power. Smugly thinking his newfound extra power would help him, Magneto then realized that his magnetic attraction was overloading, causing him to be buried under nearly every piece of metal in the surrounded area, knocking him out. Comments: Created by Creighton Barnes, Doug Booth, Francis X. Feighan, Donald F. Glut, Jack Hanrahan, Christy Marx, Larry Parr, Jeffrey Scott and Marvel Productions (see Appearances list for list of artists involved). No origin was given in any episode and there was nothing to suggest to his name was Eric Lehnsheer or Max Eisenhardt. His height and weight are presumed from his 616 counterpart. 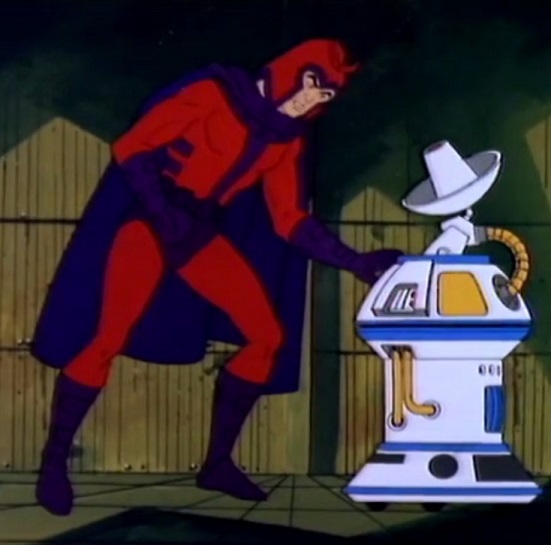 According to a few online sources, Magneto was voiced by Walker Edmiston in the '81 Spider-Man series and Michael Rye in the Amazing Friends series. 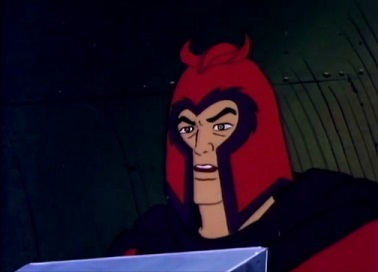 Yes, somehow Magneto was hiding on the satellite base the whole time. Among the illusions Mastermind summoned were Mephisto, Psyklop, Annihilus and the Ghost Rider. "The Prison Plot" was written by Francis Feighan and Jack Hanrahan and was the eighth episode of the first season, although IMDB credits Donald F. Glut. "A Fire-Star is Born" was written by Christy Marx and was the second episode of the second season. 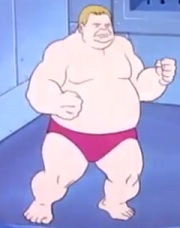 The Blob was a member of the Brotherhood of Evil Mutants. He had been arrested and was held in a prison cell designed to counter his powers. Blob presumably had the same immovability powers that his Earth-616 counterpart had. --Spider-Man & His Amazing Friends cartoon episode, "The Prison Plot"
Mastermind was a member of the Brotherhood of Evil Mutants. He had been arrested and was held in a prison cell designed to counter his powers. Mastermind had the same illusion powers that his Earth-616 counterpart had. 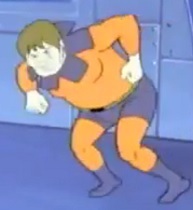 The Toad was a member of the Brotherhood of Evil Mutants. He had been arrested and was held in a prison cell designed to counter his powers. Toad had the same superhuman leaping ability that his Earth-616 counterpart had.